Wigan (/ˈwɪɡən/ WIG-ən) is a town in Greater Manchester, England, on the River Douglas, 10 miles (16 km) south-west of Bolton, 12 miles (19 km) north of Warrington and 17 miles (27.4 km) west-northwest of Manchester. Wigan is the largest settlement in the Metropolitan Borough of Wigan and is its administrative centre. The town has a population of 103,608, whilst the wider borough has a population of 318,100. During the Industrial Revolution Wigan experienced dramatic economic expansion and a rapid rise in population. Although porcelain manufacture and clock making had been major industries, Wigan became known as a major mill town and coal mining district. A coal mine was recorded in 1450 and at its peak, there were 1,000 pit shafts within 5 miles (8 km) of the town centre. Mining was so extensive that a town councillor remarked that "a coal mine in the backyard was not uncommon in Wigan". Coal mining ceased during the latter part of the 20th century. Wigan Pier, a wharf on the Leeds and Liverpool Canal, was made famous by the writer George Orwell. In his book, The Road to Wigan Pier, Orwell highlighted the poor working and living conditions of the inhabitants during the 1930s. Following the decline of heavy industry in the region, Wigan Pier's warehouses and wharves became a local heritage centre and cultural quarter. 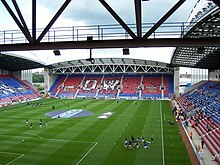 The DW Stadium is home to Wigan Athletic Football Club and Wigan Warriors Rugby League Football Club. The name Wigan has been dated to at least the 7th century and probably originally meant a "village" or "settlement". It has also been suggested that the name is Celtic, named after a person called Wigan, a name corresponding to Gaulish Vicanus, Old Welsh Uuicant or Old Breton Uuicon. This may have been linked with Tre (meaning homestead) to give an original name of Trewigan. Derivation from Brittonic *wig, 'dwelling', plus the nominal suffix -an has also been suggested (c.f. numerous places in France named Le Vigan). The name of the town has been recorded variously as Wigan in 1199, Wygayn in 1240, and Wygan in numerous historical documents. In the 1st century, the area was conquered by the Romans. The late 2nd-century Antonine Itinerary mentions a Roman settlement called Coccium 17 miles (27 km) from the Roman fort at Manchester (Mamucium) and 20 miles (32 km) from the fort at Ribchester (Bremetennacum). Although the distances are slightly out, it has been assumed that Coccium is Roman Wigan. Possible derivations of Coccium include from the Latin coccum, meaning "scarlet in colour, scarlet cloth", or from cocus, meaning "cook". Over the years chance finds (coins and pottery) provided clear indications that a Roman settlement existed at Wigan, although its size and status remained unknown. In 2005 investigations ahead of the Grand Arcade development, and in 2008 at the Joint Service Centre development, have proven that Wigan was a significant Roman site in the late first and second centuries AD. The excavated remains of ditches at Ship Yard off Millgate were consistent with use by the Roman military and possibly formed part of the defences for a fort or a temporary camp. More remains were excavated to the south, in the area of McEwen's Yard (opposite the baths), where foundations of a large and important building were discovered, together with many other Roman features. The building is 36 by 18 metres (118 by 59 ft) in size with stone walls and a tiled roof. It contained around nine or ten rooms including three with hypocausts. It had a colonnaded portico on the northern side, which presumably formed the main entrance. The structure's ground-plan and the presence of the hypocausts show it may have been a bath-house. A timber building excavated at the Joint Service Centre (top of the Wiend) has been interpreted as a barrack block. This suggests a Roman fort occupied the crest of the hill, taking advantage of the strategic position overlooking the River Douglas. The evidence gained from these excavations shows that Wigan was an important Roman settlement, and was almost certainly the place referred to as Coccium in the Antonine Itinerary. Although Wigan is not mentioned in the Domesday Book, possibly because it was included in the Neweton barony (now Newton-le-Willows), it is thought that the mention of a church in the manor of Neweton is Wigan Parish Church. The rectors of the parish church were lords of the manor of Wigan, a sub-manor of Neweton, until the 19th century. Wigan was incorporated as a borough in 1246 following the issue of a charter by King Henry III to John Maunsell, the local church rector and lord of the manor. The borough was later granted another charter in 1257–1258, allowing the lord of the manor to hold a market every Monday and two annual fairs. The town is recorded on the earliest-surviving map of Britain, the Gough Map made around 1360, which highlights its position on the main western north-south highway with distance markers to Preston and Warrington. In the English Civil War, most people in the town were Royalists and James Stanley, 7th Earl of Derby, a prominent and influential Royalist in the civil war, made Wigan his headquarters. His forces successfully captured Preston but failed in assaults on Manchester and Lancaster and two attempts to capture Bolton. Abandoning attempts to secure Lancashire, he took his forces to the Isle of Man to secure his holdings there. The Earl of Derby was absent when Wigan fell, despite fortifications built around the town, Wigan was captured by Parliamentarian forces on 1 April 1643, the takeover was complete in two hours and the town was pillaged before the defences were broken down and the Parliamentarians retreated. In 1648, Royalist forces under James Hamilton, 1st Duke of Hamilton, occupied Wigan after they had been defeated by Oliver Cromwell at the Battle of Preston. The soldiers looted the town as they retreated to Warrington, and afterwards, it experienced pestilence. Cromwell himself described Wigan as "a great and poor town, and very malignant". Wigan was described by Celia Fiennes, a traveller, in 1698 as "a pretty market town built of stone and brick". In 1720, the moot hall was rebuilt, funded by the members of the borough. It was used as the town hall and the earliest reference to it dates from the 15th century. Prior to its final destruction in 1869, the hall was rebuilt in 1829. Wigan's status as a centre for coal production, engineering and textiles in the 18th century led to the Douglas Navigation in the 1740s, the canalisation of part of the River Douglas and later the Leeds and Liverpool Canal. The canal from Liverpool to Leeds was originally to serve Wigan on a spur, transporting cloth and food grown on the West Lancashire Plain to the Port of Liverpool. When construction restarted in the 1790s, after decades pause, as coal was rising in importance due to the progress of the Industrial Revolution. The route was altered at the request of mill owners, with the spur becoming the primary route and Wigan a hub for transport of coal from the Lancashire coal pits to Liverpool and Leeds. As a mill town, Wigan was an important centre of textile manufacture during the Industrial Revolution, but it was not until the 1800s that cotton factories began to spread into the town. This was due to a dearth of fast-flowing streams and rivers in the area, but by 1818 there were eight cotton mills in the Wallgate part of Wigan. In 1818 William Woods introduced the first power looms to the Wigan cotton mills. These mills swiftly became infamous for their dangerous and unbearable conditions, low pay and use of child labour. As well as being a mill town, Wigan was also an important centre for coal production. It was recorded that in 1854 there were 54 collieries in and around the town, about a sixth of all collieries in Lancashire. In the 1830s Wigan became one of the first towns in Britain to be served by a railway; the line had connections to Preston and the Manchester and Liverpool Railway. Wigan began to dominate as a cotton town in the late 19th century, and this lasted until the mid-20th century. In 1911 the town was described as an "industrial town ... occupying the greater part of the township, whilst its collieries, factories ... fill the atmosphere with smoke". After the Second World War there was a boom followed by a slump from which Wigan's textile industry did not recover. While the town's cotton and coal industries declined in the 20th century, the engineering industry did not go into recession. The last working cotton mill, May Mill, closed in 1980. Since 2004, the town of Wigan has been divided between five of the twenty-five wards of the metropolitan borough, each returning three councillors to the 75-member borough council. The five wards are: Douglas, Pemberton, Wigan Central, Wigan West and Worsley Mesnes. The metropolitan council provides the local services. There was a rivalry between the lords of the manor and borough. The lord of the manor complained in 1328 that the burgesses were holding private markets, from which he gained no revenue. The rivalry continued in the 16th century, with Bishop Stanley unsuccessfully challenging the right of the burgesses to hold markets, believing it should be the right of the lord of the manor. In 1583 the corporation of the borough attempted to usurp the lord of the manor by laying claim to the lordship. They did so because they felt they were fulfilling the duties of the lord: to improve waste and common land and allowing construction on this land, running courts, and mining coal. A compromise was reached, dividing some power between the two parties. Under the Municipal Corporations Act 1835, the town was reformed and was given a commission of the peace. The borough was divided into five wards with a town council of forty members: two aldermen and six councillors representing each ward. Rectors from the local parish church were the lords of the manor since records began until 2 September 1861. On this date, the borough corporation bought the rights associated with the lordship. The Local Government Act 1888 constituted all municipal boroughs with a population of 50,000 or more as "county boroughs", exercising both borough and county powers. Wigan accordingly became a county borough on 1 April 1889, giving it independence from Lancashire County Council. Ward boundaries were altered, and the county borough was divided into ten wards, each electing one alderman and three councillors. The former area of Pemberton Urban District was annexed to the County Borough of Wigan in 1904, adding four extra wards to the borough. In 1974 the County Borough of Wigan was abolished and its former area transferred to form part of the Metropolitan Borough of Wigan. In April 2011, the borough along with the entirety of the county of Greater Manchester became one of 10 constituent councils of the Greater Manchester Combined Authority. Wigan is in the Wigan Parliamentary constituency, which was recreated in 1547 after having covered the borough in the late 13th century. From 1640 until the Redistribution of Seats Act 1885, the constituency returned two Members of Parliament (MPs); from then on it had only one. Since 1918, the constituency has been represented by the Labour Party. Lisa Nandy is the incumbent Member of Parliament for Wigan, having first been elected in the 2010 general election. Wigan Council takes part in the town twinning scheme, and in 1988 twinned with Angers in France. At 53°32′41″N 2°37′54″W﻿ / ﻿53.54472°N 2.63167°W﻿ / 53.54472; -2.63167 (53.5448, −2.6318), Wigan lies respectively to the west and north of Hindley and Ashton-in-Makerfield, and is about 12 miles (19 km) west of Manchester city centre and 10 miles (16 km) north of Warrington. The Grand Arcade shopping centre was opened on 22 March 2007. Construction, which cost £120 million, started in 2005 on the site of Wigan Casino and The Ritz. The area around the pier is planned to be redeveloped, in a multimillion-pound project rebranding the area as the Wigan Pier Quarter. Plans for the redevelopment of the area have been in place since 2006. Trencherfield Mill, at the centre of the pier development, has been refurbished and used for apartments and office space. The Wigan Life Centre south building opened on 19 September 2011, housing office accommodation for Wigan Council, Wigan Leisure and Culture Trust and NHS Ashton, Leigh and Wigan and a swimming pool and fitness suite. Plans for the 18-storey Tower Grand, which would have been the tallest building in Wigan, were scrapped after the Financial crisis of 2007–2008. The Galleries Shopping Centre, which houses shops as well as an indoor market, was bought for £8 million by the council in 2018 as part of a regeneration plan due to long-term decline. The former Westwood power station site was redeveloped in 2006 into the Westwood Park business park and features a large amount of Wigan MBC office space. However, plans for a £125 million 55-acre (22 ha) textiles centre on the site with 1,000,000 square feet (93,000 m2) of manufacturing and research space, in co-operation with the Chinese state-owned trading company Chinamex, fell through. The Tote chain of bookmakers has its headquarters in Wigan, providing about 300 jobs in the town. H. J. Heinz is amongst the largest food manufacturers in Europe. Their 55-acre (22 ha) food manufacturing facility in Wigan is the largest food processing facility in Europe. JJB Sports, a former nationwide sports clothing retailer, was founded in Wigan as a sports shop by John Jarvis Broughton (later JJ Bradburn) and was bought and expanded by businessman Dave Whelan. DW Sports Fitness another nationwide sports retailer and fitness business owned by Dave Whelan is headquartered in the town. The bakery chain Galloways Bakers, and William Santus & Co. Ltd, the confectioner and producer of Uncle Joe's Mint Balls, are both based in Wigan. There are 125 listed buildings in Wigan out of the 216 listed buildings in the wider borough with nine at Grade II* in the town. As well as being a Grade II* listed structure, Mab's Cross is the only Scheduled Monument in Wigan itself, out of the 12 in Wigan Borough. It is a medieval stone cross that probably dates from the 13th century. There is a legend surrounding the cross that Lady Mabel Bradshaigh, wife of Sir William Bradshaigh, did penance by walking from her home, Haigh Hall, to the cross once a week barefoot for committing bigamy. There is no evidence the legend is true, as there is no record that Lady Mabel was married to anyone other than Sir William Bradshaigh , and several facets of the story are incorrect. Haigh Hall was built in 1827–1840 on the site of a medieval manor house of the same name, which was demolished in 1820. The hall is surrounded by a 250-acre (101 ha) country park, featuring areas of woodland and parkland. The former town hall is a Grade II listed building. Designed by John McClean, Mesnes Park was opened in 1878; McClean was chosen to design the park through a competition. There is a pavilion in the centre and a lake. The Heritage Lottery Fund has donated £1.8 million to regenerate the park and Wigan Metropolitan Borough Council added £1.6 million to that figure. The pavilion and grandstand will be restored. The 20-acre (8.1 ha) Mesnes Park is north-west of Wigan town centre. It receives two million visitors a year and used to host the Wigan One World Festival. The Museum of Wigan Life (formerly Wigan Central Library) opened in 1878. A one-year restoration programme began in 2009 costing £1.9 million. George Orwell used it to research The Road to Wigan Pier. As of 2019[update], the Wigan Pier Quarter is at the heart of a regeneration programme that began in 2006 to revitalise the area. Part of Wigan's industrial heritage, Trencherfield Mill was built in 1907 and is a Grade II listed building. It houses a steam engine over 100 years old which was restored with help from the Heritage Lottery Fund. The quarter is also home to the Wigan Pier Theatre Company, which was founded in 1986. The Face of Wigan, located in the town centre since 2008, is a stainless steel sculpture of a face. Created by sculptor Rick Kirby, The Face stands at 18-foot-tall (5.5 m) and cost £80,000. Association football initially struggled to take hold in Wigan with non-league clubs Wigan County (1897-1900) and Wigan Town (1905-1908) both folding within a few years of their creation. Wigan Borough, emerged from amateur side Wigan United (1896-1914, 1919-1920), in 1920 and became the town's first club to play in the Football League when in 1921 they became founder members of the Football League Third Division North. The club left the Football League and folded in 1931. They were replaced a year later by Wigan Athletic, the town's current professional football club. Wigan's international-standard swimming pool was demolished in 2008. A new 25-metre (82 ft) pool opened in September 2011 in the Wigan Life Centre development. The original 50-metre (160 ft) pool was built in 1966 at a cost of £692,000 (£12.7 million as of 2019), Wigan BEST, named Wigan Wasps until 2004, is the town's swimming club. It has produced Olympic standard swimmers, including medal winner June Croft. Wigan Wheelers, a cycling club originally established in 1919 is based in the Town. They have social and competitive members from across the borough and further afield. Wigan has staged motorcycle speedway and greyhound racing at two venues. The Poolstock Stadium was the home of Wigan Speedway in 1947. The team moved to Fleetwood in 1948, although they raced at Poolstock in 1960. The Woodhouse Lane Stadium was used briefly in the early 1950s when the team was known as the Panthers. Wigan Warlords are an Inline Hockey team, current Under-16 national champions and European Bronze medalists. The club attracts players from Wigan and the surrounding areas. Wigan's district badminton league consists of 30 teams across three divisions. Wigan and Leigh College, a further education college with over 8,000 total students, has three three campusess in Wigan: Parsons Walk Centre, Wigan School for the Arts and the Engineering & Construction Centre of Excellence (Pagefield Centre). There is also Wigan UTC, a university technical college, in the town centre. In the wider borough, there are two sixth form colleges, St John Rigby College and Winstanley College. High schools in the town are the Deanery High School, St. John Fisher Catholic High School, St. Peter’s Catholic High School and Rose Bridge Academy (in Ince) with more throughout the borough. Since 1986, Wigan has hosted an international jazz festival. Wigan remains a centre of popular music for young people, with a number of alternative pubs and clubs in the town centre. The town also had a music collective which existed to promote the scene and help out local musicians and bands. They host activities such as recording sessions and gig advice for young musicians. Throughout the early 1990s, The Den was a popular venue for bands with acts such as Green Day heading over to play. From 2002, the annual Haigh Music Festival was held at Haigh Hall, Wigan, attracting around 7,000 guests each year. In 2011 Haigh Fest ended, due to funding issues. Since 2012 the free Wigan Live Festival, held in the town centre, has taken its place. The town currently has a host of venues putting on gigs for upcoming local bands including Indiependence, The Boulevard, and The Swinley. NXNW has hosted the annual Wigan Festival of Art, Music and Literature known as North By North Western Festival. The collective is a voluntary non-profit making organisation and the festival takes place at various venues across the town. Since 2010, the Wigan Diggers Festival has taken place on the second Saturday of September. The festival brings together a significant number of socialist organisations and sympathetic musicians to celebrate the life, ideas and influence of the Wigan-born, Gerrard Winstanley, founder of the Diggers (True Levellers) Movement. Recent headliners have included significant Wigan bands The Railway Children and Merry Hell. Wigan is home to the annual World Pie Eating Championship, usually held at Harry's Bar on Wallgate. The competition has been held since 1992, and in 2006 a vegetarian option was added. Wiganers are sometimes referred to as "pie-eaters". The name is said to date from the 1926 General Strike when Wigan coal miners were starved back to work before their counterparts in surrounding towns and so were forced to metaphorically eat "humble pie". In addition, Wigan is well known as the home of Uncle Joe's Mint Balls. A local tradition since the 1980s is Boxing Day fancy dress, which in recent years has received national media coverage. In the television series Wallace and Gromit, the title characters live at the fictional 62 West Wallaby Street in Wigan. There are two railway stations in Wigan town centre, Wigan North Western and Wigan Wallgate. North Western is on the north-south electrified West Coast Main Line. Virgin Trains West Coast provides express trains to London Euston, Birmingham, Lancaster, Carlisle, Edinburgh and Glasgow. Northern operated trains to Preston and Blackpool North and a regular local service along the line to St Helens and Liverpool Lime Street. Wigan Wallgate serves lines running east and west from Wigan. Northern operate trains to Southport and Kirkby (with connections to Liverpool Central and the Merseyrail system). Frequent local services also operate (in co-operation with TfGM) to Bolton and Manchester, with most trains from Wigan continuing through to other destinations such as Manchester Airport, Stockport and Rochdale. Pemberton station serves the Pemberton area of the town. A horse tramway was built in 1880 by the Wigan Corporation and leased to a succession of private companies to operate services to Pemberton, Aspull and towards Standish. Steam tram operation was introduced quickly, but the network always struggled to pay its way and just after the start of the 20th century Wigan Corporation gradually bought the operating leases and converted the network to electric tramcar operation. However, the network was saddled with a mix of standard gauge and narrow gauge lines, reducing efficiency and increasing costs, and the last of the Wigan Corporation Tramways were closed in 1931 to be replaced by buses which had begun as 'feeder' services to the trams but which had shown themselves to be faster and more flexible. Trolleybuses were operated on a single route from Wigan to Martland Mill from 1925 to 1931. The current network of local buses, coordinated by Transport for Greater Manchester (TfGM) and departs from the Wigan bus station in the town centre. The bus station reopened in late 2018 after a £15.7 million, two-year redevelopment. Local buses serve Wigan and district with National Express long-distance coach services. Bus companies operating in the area include Stagecoach Manchester, Arriva North West, Diamond Bus North West, Maytree Travel, Wigan Buses and Stagecoach Merseyside & South Lancashire. ^ Frangopulo 1977, p. 139. ^ Ekwall, Eilert (1922). The Place Names Of Lancashire. Manchester University Press. p. 103. ^ Waddelove 2001, p. 299. ^ Oxford Archaeology North 2011, p. 14. ^ Oxford Archaeology North 2011, p. 2. ^ Oxford Archaeology North 2011, p. 30. ^ a b c d McNeil & Nevell 2000, p. 66. ^ McNeil & Nevell 2000, p. 65. ^ Vallely, Paul (30 April 2003). "On the road again". The Independent. London. Archived from the original on 30 September 2007. It seems funny to celebrate Orwell for highlighting all our bad points, but Wigan wouldn't be anywhere near as famous without him," says the Wigan Pier Experience's manager, Carole Tyldesley. "In the end George Orwell has proved to be a strong marketing tool. ^ Vallely, Paul (30 April 2003). "n the road again". The Independent. London. Archived from the original on 30 September 2007. What he wrote still colours people's views of Wigan ... But if Wigan is going to grow it's got to leave Orwell behind and sell all that. ^ "Ward Boundaries". Metropolitan Borough of Wigan. Retrieved 22 February 2009. ^ Cooper 2005, p. 12. ^ "Town twinning with Angers". wigan.gov.uk. Archived from the original on 8 May 2014. ^ "Major plans for new Wigan Pier Quarter revealed". Manchester Evening News. 16 April 2018. ^ a b Wigan Metropolitan Borough Council (January 2006). "The Wigan Pier Quarter: Planning and Regeneration Strategy" (PDF). Wigan.gov.uk. Archived from the original (PDF) on 21 September 2011. Retrieved 15 October 2011. ^ "Wigan Pier Quarter Plan" (PDF). Wigan Council. ^ "First Peek inside Life Centre". Wigan Observer. 16 September 2011. Retrieved 26 November 2011. ^ Pollard, Pevsner & Sharples 2006, p. 671. ^ a b James Illingworth (30 October 2018). "The developments changing Wigan town centre - including the opening of new £15.7m bus station". Manchester Evening News. ^ "China dream is smashed". Wigan Today. 5 September 2011. ^ "Dave Whelan: From Wigan to Barbados, the incentive that's hard to beat", The Independent, London, 8 May 2005, retrieved 26 April 2009 Retrieved 26 April 2009. ^ "Dave Whelan doubles size of DW empire in one go". Wigan Today. 31 August 2016. ^ Historic England. "Mab's Cross (41800)". PastScape. Retrieved 30 December 2008. ^ Mab's Cross, Wigan, Images of England Retrieved 18 May 2008. ^ Bob Blakeman, "Mab's Cross" – legend and reality, Wigan Archaeological Society Retrieved 19 June 2008. ^ Historic England. "Haigh Hall (41877)". PastScape. Retrieved 30 December 2008. ^ Historic England. "Haigh Park (1145831)". PastScape. Retrieved 30 December 2008. ^ Pollard, Pevsner & Sharples 2006, p. 668. ^ Charles Graham (15 October 2008), Mesnes Park hits the jackpot, WiganToday.net Retrieved 28 December 2008. ^ "Department of Archaeology". University of York. 2002. Archived from the original on 29 June 2007. Retrieved 28 December 2008. ^ Mesnes Park Restoration Plans Given £3.4m Boost, Wigan.gov.uk, 19 December 2007, archived from the original on 23 February 2012 Retrieved 28 December 2008. ^ "The Museum of Wigan Life reopens after a £1.9 million restoration project". Culture24. 5 May 2010. Retrieved 15 October 2011. ^ Historic England. "Trencherfield Mill (1384508)". National Heritage List for England. Retrieved 15 October 2011. ^ "Trencherfield Mill Steam Engine". Wigan Leisure and Culture Trust. Archived from the original on 22 November 2011. Retrieved 15 October 2011. ^ "Arts information". Wigan Leisure and Culture Trust. Archived from the original on 22 May 2012. Retrieved 15 October 2011. ^ "Face – The future". wigan.gov.uk. Archived from the original on 23 February 2012. Retrieved 6 November 2009. ^ "Wigan Wheelers". www.wiganwheelers.org. Retrieved 16 December 2016. ^ Wigan Centres, Wigan and Leigh College, Retrieved 11 January 2018. ^ "Maps of schools in Wigan". Wigan Council. Retrieved 11 January 2018. ^ Zoe Graham (22 November 2004), Wigan Casino revisited – Northern Soul at the history shop, 24hourmuseum.org.uk Retrieved on 9 December 2008. ^ "About Wigan Jazz Festival". wiganjazzfest.co.uk. The Music Continuum. Retrieved 8 January 2019. ^ "Article About Haigh Music Festival". ^ "Gerrard Winstanley & The Diggers". wigandiggersfestival.org. Retrieved 8 January 2019. ^ "Pie-eating championship goes slimline". The Guardian. London. 23 November 2006. Retrieved 3 November 2008. ^ "Artist's search for Boxing Day fancy dress information". Wigan Today. 12 January 2018. ^ "Boxing Day fancy dress in Wigan – in pictures". The Guardian. 27 December 2015. ^ "A cracking town, Gromit". Wigan Today. 16 November 2005. Archived from the original on 20 October 2007. Retrieved 11 August 2018. Wikimedia Commons has media related to Wigan. Wikivoyage has a travel guide for Wigan.